Hi this is Terri Borman child care provider and author of “Shapes Go to School.” This week’s blog is a continuation of “If Vaccines Don’t Cause Autism, Then What Does?” Last week we looked at vaccines as a cause of autism, but with so many studies that have been done on vaccines I feel confident that they are not the cause of autism. We just cannot ignore the fact that the number of children being diagnosed with autism started to rise in the 1980’s and continues to rise now. Studies have shown that taking illegal drugs or drinking alcohol during pregnancy has serious negative effects on the infant’s brain development. So what about the pain relievers we can buy over-the-counter that we think are safe to take? Well it turns out that taking the over-the-counter pain reliever, paracetamol, commonly known as acetaminophen or Tylenol in the U.S., during pregnancy may also cause problems to the infant’s brain development. An infant’s brain isn’t fully developed at birth so giving an infant paracetamol for teething or vaccines could have risks too. Since 1995, paracetamol is widely used during circumcision. This could explain why more males than females are affected by autism. In 2008, a parent survey based study presented evidence that paracetamol given after a MMR vaccine may be associated with development of autism. In 2013, a prospective cohort study showed that children who had been exposed to paracetamol for more than 28 days of pregnancy had gross motor skill issues, poor communication skills, and more behavior problems compared with unexposed siblings. 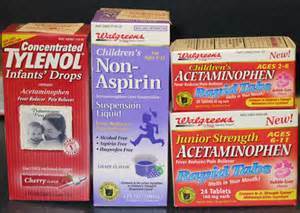 Good P. Did acetaminophen provoke the autism epidemic? [PDF]. Altern Med Rev. 2009;14(4):364–72. PMID 20030462. Brandlistuen RE, Ystrom E, Nulman I, Koren G, Nordeng H. Prenatal paracetamol exposure and child neurodevelopment: a sibling-controlled cohort study. Int J Epidemiol. 2013. doi:10.1093/ije/dyt183. PMID 24163279. Prenatal and perinatal analgesic exposure and autism: an ecologic link. Environmental Health. May 9, 2013. doi:10.1186/1476-069X-12-41.. PMID 23656698. This entry was posted in Uncategorized and tagged acetaminophen, Autism, brain development, paracetamol, tylenol on June 1, 2014 by terriborman. I personally think there are a lot of contributing factors as well as it being naturally occurring and greater understanding of what it is.